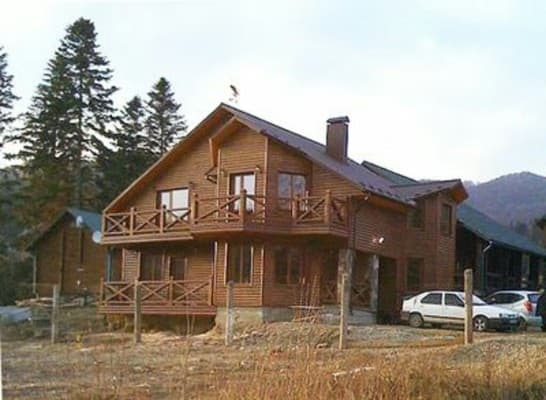 Cottage "Under the Golden Eagle" is located in the village of Migovo, near the ski resort "Migovo". Guests are offered accommodation in a two-story house, which can accommodate up to 8 guests. The first floor has a living room with fireplace, kitchen and bathroom. The kitchen is equipped with an electric stove, microwave, refrigerator, electric kettle and necessary utensils. On the second floor there are four double rooms. 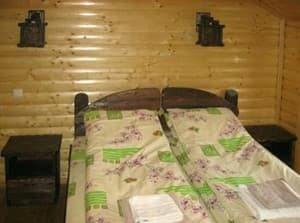 Each room is equipped with beds, a wardrobe, a TV, a table with chairs and a bathroom. Two rooms have a balcony with a view of the ski resort. Free Wi-Fi is available throughout the cottage. Relaxation is offered to guests in the sauna, and there is also an outdoor heated swimming pool. For fans of outdoor activities, for an additional fee, organized tours and hikes in the mountains, riding horses, bicycles and quad bikes, ski equipment rental, in the summer - the collection of mushrooms and berries. At guests' service is a gazebo with barbecue and grill. Spring water is supplied to the house. 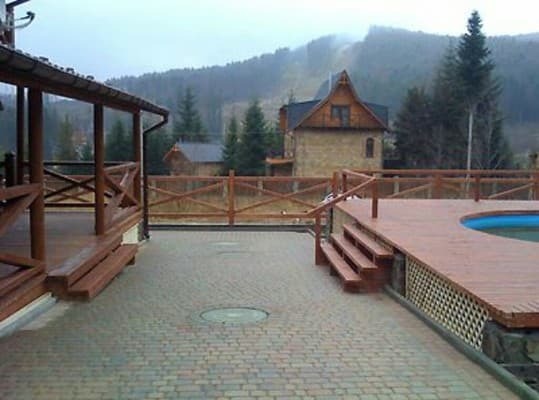 In the ski resort "Migovo", 300 meters from the cottage, there is a ski slope with a drag lift. The length of the ski runs is 1.5 km. 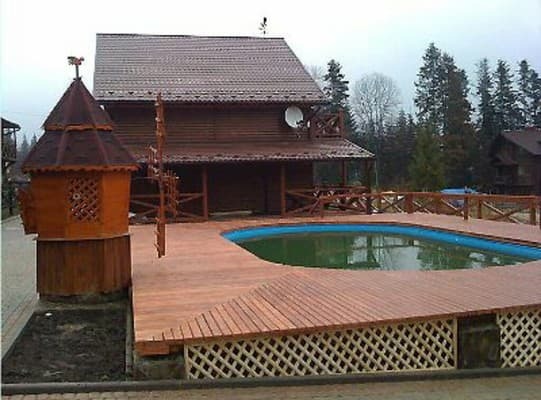 Cottage "Under the Golden Eagle" is located 7 km from the P-62 (Chernivtsi-Vyzhnytsya-Verkhovyna). The distance to Vyzhnytsya is 30 km, to Chernovtsy - 58 km, to the nearest store - 30 m. In a walking distance from the cottage there is a restaurant "Kolyba", which serves Hutsul cuisine. Also near is Solonets tract with mineral springs and Lake Maidan. Description of the room: Comfortable two-storey cottage. On the ground floor of the house there is a living room with fireplace, large table and plasma TV, equipped kitchen, linden wood sauna, mini pool with Jacuzzi for 5 people, two shower cabins. Heating floor. The second floor has four double rooms with wooden furniture. Each room is equipped with a double bed with an orthopedic mattress, bedside tables, a closet, a table with chairs, a TV, an electric kettle and a bathroom. Possible additional space for the child in the form of a clamshell. Two bedrooms have a balcony and tables with sun loungers. It can accommodate 10 people (at an additional cost). Cottage "Under the Golden Eagle" has a fully equipped kitchen, where guests can prepare themselves. Also near the estate there is a restaurant "Kolyba" and many other cafes. 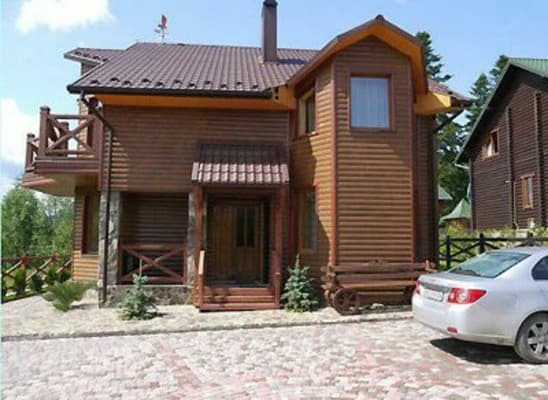 Cottage "Under the Golden Eagle" is located 7 km from the P-62 (Chernivtsi-Vyzhnytsya-Verkhovyna). The distance to Vyzhnytsya is 30 km, to Chernovtsy - 58 km, to the nearest store - 30 m. In a walking distance from the cottage there is a restaurant "Kolyba", which serves Hutsul cuisine. Also near is Solonets tract with mineral springs and Lake Maidan. By public transport: by train or bus to Chernivtsi, further from the AS-1 minibus to the village. Migovo (daily route after schedule). By car: by the route Chernivtsi - Vyzhnytsya - Verkhovyna (R-62), in the village of Berehomet take the sign of the tourist complex "Migovo". Go to the end of the village, near the main entrance to the complex turn into the street to the right (near the sign "Carpathians"). The cottage will be on the left side of the second from the turn.